Teeth are an integral part of overall health and with proper care people can keep their teeth for a lifetime. Good oral health starts at home and should begin early – even before a child's first teeth erupt. Baby teeth generally start to peek through the gums at six months of age. Besides allowing a child to eat and speak, baby teeth "hold the space" for adult teeth that will develop later. Parents play an important role in caring for their children's mouths and helping them develop good oral cleaning habits. The first visit to see the dentist and dental hygienist is recommended before the child turns one, and then regular visits should be scheduled. Brushing is the first step to a clean mouth and a healthy smile. Proper brushing should take 2 - 3 minutes, keeping in mind that a effective brushing cleans every exposed surface in a gentle, massaging motion. Hold the toothbrush at a 45° angle where the teeth meet the gums. Gently brush away from the gums. Use gentle circles to clean the outer tooth surfaces and the gumline, focusing on 2-3 teeth at a time. Gently brush the inner tooth surfaces on both sides using a back and forth motion. Maintain a 45° angle and be sure to brush the tooth surface and the inner gumline. To brush behind the upper and lower front teeth, move your brush to a vertical position and use gentle up and down strokes with the front half of the brush. Gently brush your tongue and the insides of your cheeks to remove bacteria and freshen breath. Brushing alone isn't enough to clean all surfaces of the teeth. Plaque and food particles build up between the teeth and under the gumline where your toothbrush can't reach. Given the high incidence of interproximal (between teeth) decay in children, flossing and flossing alone is the most important preventive tool. Failing to floss leaves up to 35% of tooth surface uncleaned and can lead to tooth decay and gum disease. Use a piece of floss about 18 inches long. Wind it around your middle fingers, leaving about 2 inches to work with. 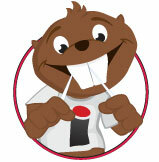 Hold the floss between your thumbs and index fingers and use your index fingers to guide the floss between the teeth. Gently slide the floss up-and-down between the teeth, following the curves of each tooth. Wrap the floss around the base of each tooth in the shape of a "C", making sure to get beneath the gumline and both sides of every tooth. Remove the floss from between your teeth with the same back-and-forth motion. Use clean sections of floss as you move from tooth to tooth. Floss Picks are gaining popularity with dental professionals and provide an effective alternative to traditional spooled dental floss. 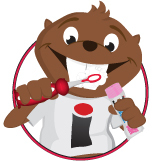 Get those teeth sparkling clean with your very own Bucky Beaver toothbrush. 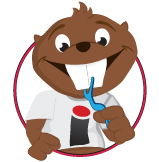 Your Bucky Beaver toothbrush helps fight tooth decay, plaque and assists in the prevention of gum disease. 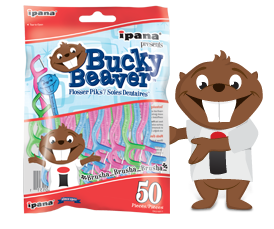 ipana Bucky Beaver children's toothpaste with fluoride helps keep kids' smiles bright! 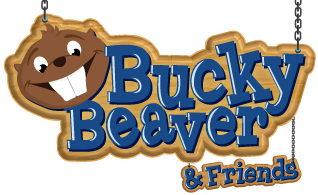 This Bucky Beaver toothpaste helps remove plaque and fight tooth decay, when used as part of an oral health program that includes regular flossing and dental check-ups. 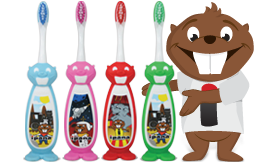 Fight tooth decay with fun and easy to use Bucky Beaver Flosser Piks. 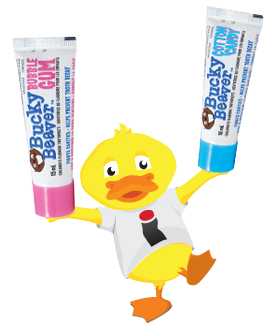 They feature our new premium ultra strong, non-shredding, low friction floss and come in 3 fun colours!